Farmers from Brussels and the surrounding area delivered milk to the Rosewood Dairy on what today is known as County S. Today Rosewood Dairy is operated as a cheese plant by the Renard family. Photographer Len Villano photographed this image at the Belgian Heritage Center. Looking into the history of Brussels, you can almost hear the clomp of sabots echoing down through the years. The great exodus from Belgium to what we know today as southern Door County took place in the mid-19th century as northern Europe experienced a food crisis caused by potato blight. Everyone has heard of the great Irish famine that was caused by the potato blight, with as many as one million deaths due to starvation and up to two million refugees seeking a better life in the United States or Australia. We hear about the Irish famine because that country relied more on potatoes than any other nation — 32 percent of its arable land was devoted to the potato in 1845, the year the blight struck, compared to 14 percent of the arable land in Belgium. That amount of cropland devoted to potatoes put Belgium in second place behind Ireland for potato crops. While Belgian farmland was some of the richest in Europe, it also had the highest population density. In 1846, 66 percent of the farms were less than 2½ acres. Belgian potato production in 1844 was 850,000 tons. The next year it dropped to 110,000 tons. The potato failure occurred at the same time as a 50 percent drop in rye production and a 26 percent drop in wheat production. An estimated 50,000 Belgians died due to the potato blight and other crop shortages, and the exodus from the country kept Belgium’s population from growing more than a fraction of a percentage point well into the 1860s. Emigration was the last hope of survival for many families. 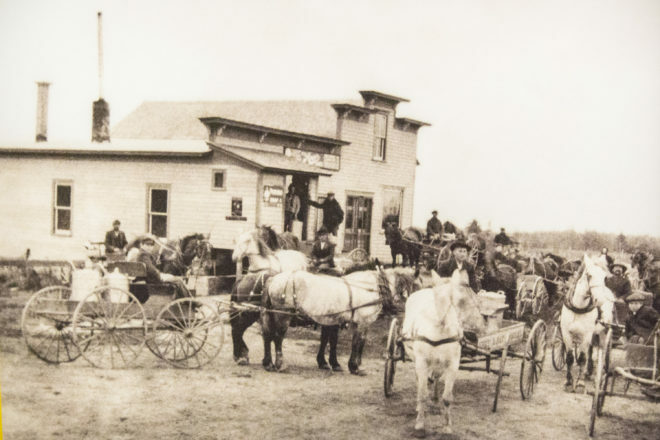 The exodus to the New World began in September 1852 when two families from the Belgian town of Grez-Doiceau left their homeland and made their way to a wild new land that was called Wisconsin. In May of 1853 — 10 more families, comprising a total of 81 people — also left Grez-Doiceau to found a Belgian community in Wisconsin. A plaque stating such was erected on the town hall in 1988. According to an account by an unnamed original immigrant that appears in Hjalmar Holand’s History of Door County, Wisconsin: The County Beautiful, here are the names of the heads of those 10 families: Francois Petiniot, Etienne Detienne, Martin Paque, Phillip Hannon, Adrian Masy, Joseph Moreau, Jean Baptiste Detienne, Joseph Jossart, Lambert Bodart and Jean Martin. The Belgian settlers soon learned they had not arrived at the land of milk and honey. In 1854 – 55, as many as 15,000 other Belgians arrived in the area, creating a triangle of Belgian communities that encompassed parts of three counties — Door, Kewaunee and Brown. They brought with them names from their homeland that would serve just as well here in this new land, so we have Rouge, La Misere, Rosiere, Walhain, L’Union, Thiry Daems, Namur and, of course, the great metropolis itself, Brussels. As life improved for the hardworking settlers, the great fire of 1871 destroyed acres of woodland and put an end to the Belgian shingle business. However, the fire also cleared a lot of land, making it easier to convert to farmland. Farming became the major source of income for the Belgians. And Belgian heritage is celebrated to this day through the Belgian Heritage Center in Brussels. The town itself was organized by election in April 1859.